Leading Distributor of Schedule V Gaskets - SSP Manufacturing, Inc. Schedule V is a popular type of standard sanitary gasket used in food and beverage industries. It is available in the market in a wide range of materials for different applications. 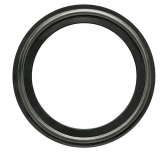 At SSP Manufacturing, Inc. you can find high-quality Schedule V gaskets made from FDA grade materials. We are known to provide fastest turnaround times. 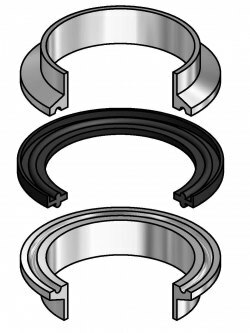 Tuf-Flex®:This material helps the gasket withstand a wide temperature range, which varies from -20°F to 300°F. Tuf-Steel®: The Tuf-Steel® material has a capability to survive temperatures varying from -350°F to 550°F. The gaskets made from this material generally have an extended service life. Platinum Silicone: Schedule V gaskets that are made from platinum silicone material have an operating temperature range from -40F° to 450°F. These materials are mainly used for low temperature applications. FKM Fluoroelastomer: FKM Fluoroelastomer material is typically used for steam applications. This material has a capability to withstand temperature ranging from -30°F to 400°F. EPDM:Schedule V sanitary gaskets made from EPDM are ideal for low pressure steam applications with a temperature range varying from -30°F to 300°F. The material is highly resistant to strong and oxidizing chemicals, vegetable oil, animal oil, and ozone. Buna N: The Buna N material is ideal for temperature ranges from -30°F to 200°F. This material is highly resistant to petroleum based fluids. This makes Buna N the most preferred choice of material for equipment, where petroleum based fuels, oils, and lubricants are involved. Please contact us by phone 888-238-SEAL or email at rrom@sspseals.com with any questions. Please enter correct captcha code. 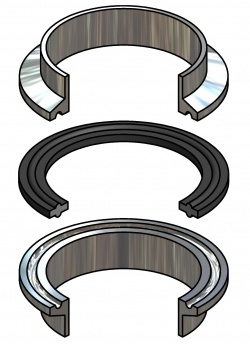 Need Information about gasket for your new application? SSP Manufacturing Inc. © 2019. All Rights Reserved.